ChBE GAMES campers listen to professor Mary Kraft as she explains the gold nanoparticles activity. In the 2018 camp, about 80% of the participating students were from Illinois, in particular the Chicago suburbs. About 15–20% of the cohort were from out of state, coming from as far as California and Florida. However, one of the attendees came from even further away—all the way from India. A ChBE GAMES camper works on an activity to make oobleck. 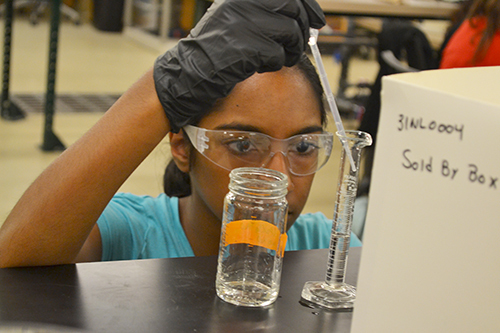 The girls who took part in the camp participated in a variety of activities, including demonstrations, presentations, fun hands-on activities, and tours which exposed them to the breadth of chemical engineering. For example, they participated in six experiments led by Professor Diwakar Shukla, who is in his second year as the Director of the ChBE GAMES camp, and his lab team. The experiments involving distillation, polymer extrusion, acid rain, starch straining, foaming face wash, and continuous distillation. 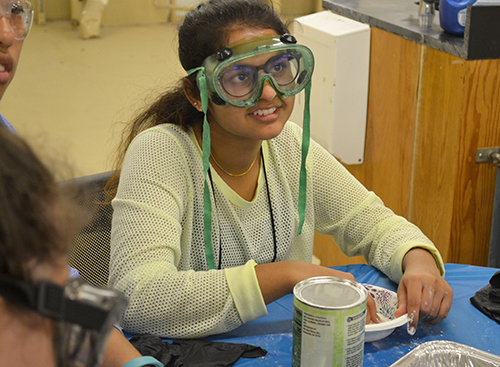 The campers also participated in a number of other fun experiments. For instance, the Professor Diao and his lab led the campers in activities making chocolate shapes, drying them, and discussing how chocolate crystallizes. The experiment ended, of course, as one would have hoped—the students got to eat the chocolates! 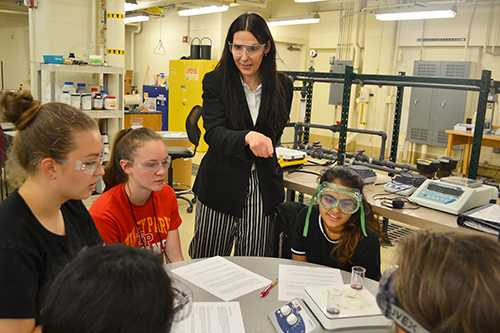 In another session, Professor Mary Kraft and her team led the campers in an activity about gold nanoparticles, during which the students aggregated a gold colloid. Another popular activity was the hydrogel demonstration led by the Kong lab, wherein the hydrogels run after each other on top of water. 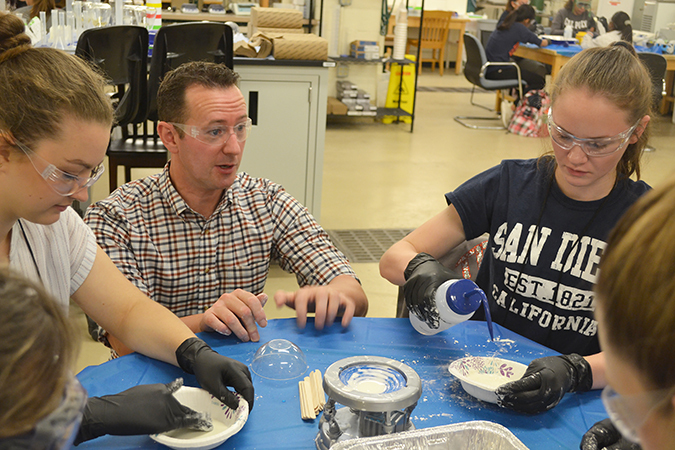 The students also enjoyed making oobleck courtesy of the Rogers lab team. Another activity Shukla and his group led was called computational games. This involved a software program that teaches students about proteins and how they take shape, thus showing the students a type of engineering about microscopic parts of their own bodies instead of that of a physical object. The exercise, which runs like a quiz, had the high school students input the protein structures and get scores, gradually moving on to tougher problems. Shukla believes this activity instilled confidence in the girls, saying, "It tells them that women can be computer scientists!" A ChBE GAMES camper pipettes during the gold nanoparticle activity. Thus, Shukla cites his reward for organizing the event as “more diverse groups, a more diverse research community, a more accommodating academic environment.” He also has a more personal motive behind arranging the camp: his wife is also a professor in ChBE and he wants her to feel more at home in the department and the academic community at large. 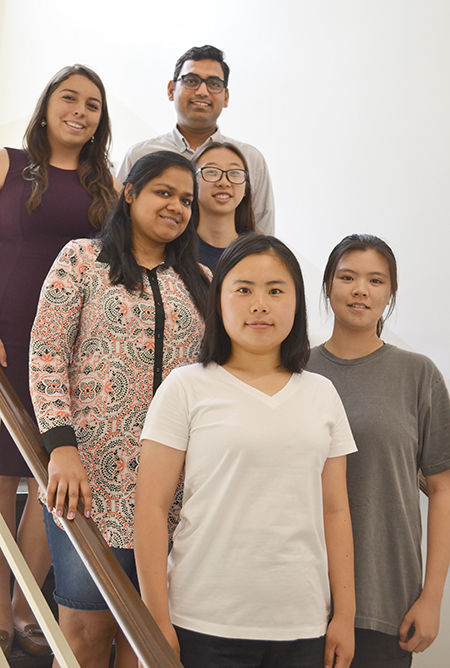 The Shukla lab team who assisted with some ChBE GAMES activities. In light of his gender equity goal, one of the major changes he sought to effect this year was having as many as possible of the lab assistants, and TAs involved be women. He reasoned that they “serve as a good role model for these high school students.” He also sought to ensure that all the female professors in the department participate this time. These includee Dr. Deborah Leckband, a Professor of Chemistry and the Reid T. Milner Professor of Chemical Sciences; Dr. Mary Kraft, an Associate Professor and Robert W. Schaefer Faculty Scholar; and Dr. Ying Diao, Assistant Professor and Dow Chemical Company Faculty Scholar. Their areas of expertise range from biology to designing solar cells and materials. A ChBE GAMES camper completes an activity lead by the Flaherty lab group. Sydney Nelso shows off the tube she made from the polymer extrusion activity. While the deeper-seated issues relating to the gender disparity in STEM fields cannot be completely eradicated by programs such as the GAMES camps, they prove a great first step in involving more girls in such disciplines from a younger age, which might lead to their choosing the discipline as a career. 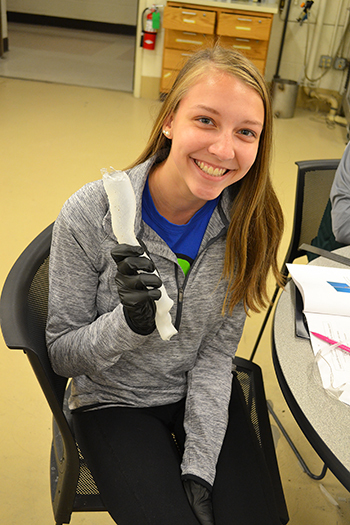 For example, Sydney Nelson, a rising junior at Tri-Valley High School, came to GAMES camp to see if she liked chemical engineering before committing four years of her college career to it. Excitedly describing the discussion during her favorite experiment, which tied in biology, she says, “We talked about how viruses can infect cells and what chemicals could be added. That’s what I’m interested in, drug manufacturing and viruses.” After experiencing the camp, Nelson seemed convinced that chemical engineering would be in her future. 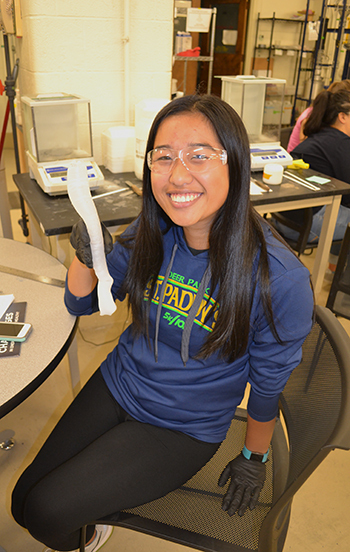 Tiffany Yen shows off the tube she made from the polymer extrusion activity. Another rising senior, Tiffany Yen, from Lake Zurich High School, was similarly convinced to pursue chemical engineering in college. Although she did not know what chemical engineering entailed when she first came to the camp, she now plans to make it her major and says that participating in this camp gave her the final push to make the decision. Yen had also participated in the computer science and aerospace camps over the past two years, but didn’t believe they were the right fit for her. 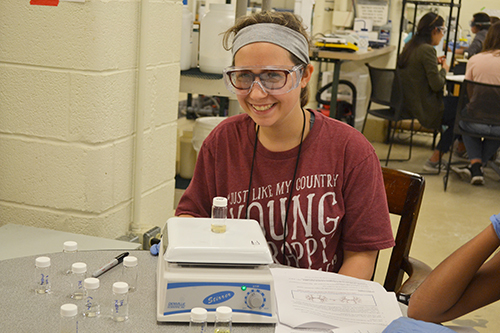 Having taken an AP chemistry class, she actually understood what was going on in this year’s camp, which she believes played a big part in her enjoying it the most. These students demonstrate why programs such as the GAMES camps are essential in inspiring young girls to discover a love for STEM that they may not have known they had before. Story by Niharika Roychoudhury, I-STEM undergraduate student, with Elizabeth Innes. Photos by Elizabeth Innes, Communications Specialist, I-STEM Education Initiative. ChBE GAMES campers work on making oobleck.